Last Friday, my Mom made another fabulous, homemade pizza baked in her stoneware pan!! My Mom has made homemade pizza for over 20 yrs thanks to watching TV cooks introducing how to make homemade pizza dough and many flavors of crust and toppings!! 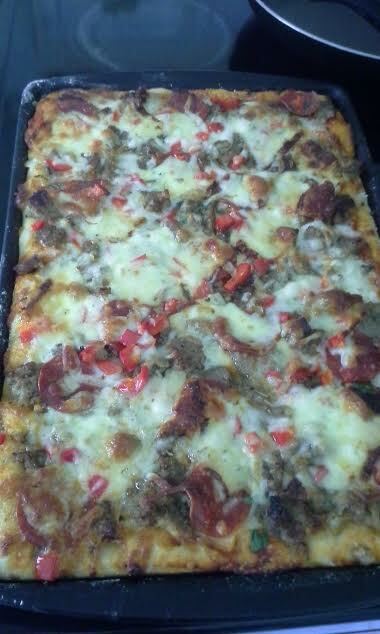 This pizza had chopped fresh Italian herbs, red bell peppers, sausage and pepperoni, sweet onions, mozzarella and Parmesan cheeses, and drizzled with olive oil!! We ate this pizza with salad and it was delicious!! Thank you, Lisa! Nothing beats my Mom's homemade pizza!